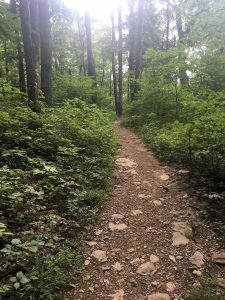 While doing a day hike along the Appalachian Trail, I crossed paths with a young man and young woman, both looking very health, strong, and able bodied. They had walked nearly 1000 miles with more than another 1000 miles to go. They were confident that they would reach Maine by the fall. While impressive, I didn't think twice about their health and strength because I (and most of my family) have been able bodied most of my life. And, it's what we see portrayed as normal on social media, TVs, and movies. It's quite surprising that able bodies are considered the norm because, according to the US Census, nearly 1 in 5 people in the U.S. have a disability. And many more of us have accessibility needs which aren't classified as disabilities. I have managed migraine triggers for decades and in recent years I contend with nausea and headaches caused by air fresheners. Some of us have transient accessibility needs, like needing a knee scooter for several weeks, going through a period of trauma, chemo, or crashing fatigue. And nearly all of us will experience new and lasting disabilities as we age. What would it be like to see people with differences like these as the norm, rather than as outliers? And what would society be like if we planned for each other's needs rather than shaming or ignoring them? I had a rare and beautiful opportunity last summer to attend the Buddhist Peace Fellowship(BPF)'s summer retreat. Each morning, the "access pixies" spent 10 minutes inviting us to share what our special needs were for the day and seeing what could be done about those needs. What could we, as a group, do to support each person's uniqueness? There were people in bodies that required scooters, so we made sure to leave enough space in the meeting rooms for them to easily maneuver; there were some people whose fatigue required them to lie down or leave events early; and by the end of the week I felt comfortable enough to ask that the shades be drawn to prevent an impending migraine aura. It was exhilarating to be asked what I needed to be fully present, in a way that was the opposite of shaming. In Buddhist practice, we regard the beings who embody particularly wholesome characteristics as Bodhisattvas. The Bodhisattva of Compassion is Avoloketeshvara. It's said that Avoloketeshvara has 1000 eyes, each on the palm of a hand so she can see who needs what and provide appropriate assistance. She accepts everyone and makes space for everyone. Our access pixies embodied Avoloketeshvara -- making sure that everyone had what they needed to really be there. I've been reading a book -- Emergent Strategy: Shaping Change, Changing Worlds -- by author and activist adrienne maree brown. In this book, she talks about living the world we want to see right now, rather than imagining a future idyllic world and trying to get there. This is what I saw modeled at the BPF retreat. We were living in a microcosm of the macrocosm we want to be part of. It may appear to be a less efficient world, but it's one in which no one is left behind and which reflects the truth that we need each and every person in order to be whole. So, we wait for each other, making sure everyone is with us before we take our next step. Prioritizing being, or process, over outcome. Once, we had a bunch of cousins visiting and we decided to go out to dinner. We piled into two cars and drove away. At the end of the block, my car phone rang, and the caller ID was from our home number. My first (ridiculous) thought was that someone had broken into our house and was calling me. I picked up the phone, and my daughter Hanna said, "Hello?" In the chaos and focusing on outcome rather than process, she had been left behind. And she was pretty sad about it. When we assume that everyone is, or should be, able bodied, ignoring individual needs, we leave lots of people behind. We can learn to ask what people need to be comfortable and what they require in order to show up. In our mindfulness community, we are now introducing ourselves by name and sharing what accommodations we might need for that session. We don't assume that needs stay the same from week to week, or even from day to day. If we don't already have a disability, someday we all will have one or more "special" needs. We practice including everyone because we know we all inter-are with each other. As Dr. Martin Luther King Jr. put it, we are "tied in a single garment of destiny." Fifteen minutes further along the Appalachian trail, I passed another couple. I could hear them coming for several minutes as they panted up the hill toward me. They looked significantly older than the first couple -- somewhere in their mid-60's maybe. I assumed, based on their age and gasping, that they were out on a short day hike. But when I asked, they told me that, like the younger people I had just seen, they were going all the way. They too had come 1000 miles step by step and were planning to reach Maine in four months. I was very surprised! Seeing them reminded me of something else very important about leaving no one behind. Sometimes, maybe quite often, my assumptions about someone's abilities are way off. I can't assume to know what a person's needs are based on how they look or sound. The only one who knows what someone needs is the person themself. I am thinking more critically about my beliefs about what's "normal" and the assumptions I make about people based on their physical, mental, or intellectual appearance or abilities. What space do those of us in leadership roles create for people whose abilities are different from our own or whose abilities are different from what we expected? Can we be students of people with different needs -- not assuming we know what they want or need, but being willing to learn from them? To start learning, check out this excellent book, Brilliant Imperfection: Grappling with Cure by Eli Clare. Who are we leaving behind and what are we losing by leaving some people out of conversations and communities? How can we transform our practices and cultures so that we stop leaving others behind? Happy to hear your thoughts in the comments below. Friends, much of my inspiration for writing is to hear your thoughts about what you’ve read. Please share in the comments below - or simply share with others on social!